In many ways, the trip didn’t follow the designed script. In others, it went better than anyone could have hoped. Middleton’s baseball team traveled to Florida last week under the premise it would play four games. Instead, the Cardinals played one official game and had three scrimmages. The good news from Middleton’s perspective is that its young and inexperienced team played like veterans. In Middleton’s “official” game, it rolled past Trinity (Ill.), 11-0. The Cardinals also notched two wins over Rosemount (Minn.), 9-0 and 16-3, and downed Eastview (Minn.), 8-6. “Overall, I was very pleased with our trip and how our kids handled themselves both on and off the field,” Middleton first-year manager Brent Jorgensen said. “With this being my first trip and first real look at our guys against other varsity competition, I was happy to see our kids come out and battle every inning. Obviously, it is early in the season and we still have many things to improve upon, but I liked the way we attacked the baseball while we were hitting and the way our pitchers challenged hitters. Middleton approached all four games like they were “official” contests, and was thrilled with the results. The Cardinals outscored their opponents 44-9, had 43 hits and 16 extra base hits. “Everyone that played in the scrimmages or game had multiple quality at-bats and played well defensively,” Jorgensen said. Dylan Carrington led the offense with seven hits on the trip, including three doubles and a triple. Ben Collier and Cooper Holewinski both had five hits, as well. Matt Ballweg led Middleton’s pitchers with 12 strikeouts in six innings during the Cardinals’ first scrimmage. 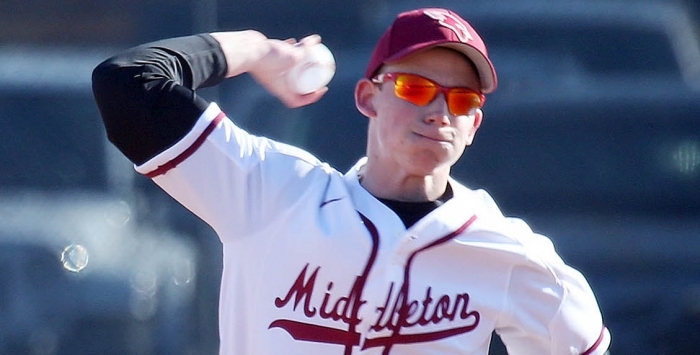 Sophomore Quinn Hodgman had eight strikeouts in four innings in Middleton’s win over Trinity. • On deck: Middleton hosted Madison East Tuesday in its Big Eight Conference opener, then is at Madison East Thursday at 5 p.m. The Cardinals then at Verona on April 9 at 5 p.m., then host Verona on April 11 at 5 p.m.